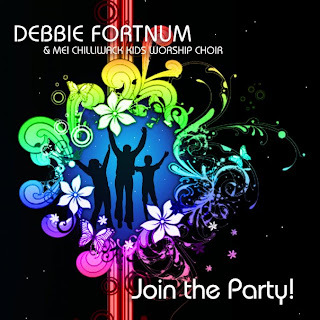 Debbie Fortnum, a vibrant and passionate BC singer and songwriter, is introducing her new Kids & Family Worship CD, JOIN THE PARTY at a CD release celebration on April 28th and 29th at Chilliwack Alliance Church (Young Rd.) This fun and meaningful new CD is set to become a dynamic worship and discipleship tool for kid's ministries, youth groups, camps, churches and families! Don't miss the CD release concert which will feature the 75 voice MEI Chilliwack Kids worship choir and other special guests including Kevin Pauls and Chris Janz. Tickets are $5 (16 and under) and $10 (17 and older) and are available at House of James (Abbotsford), Verse (Chilliwack), and Celebration (Surrey).